In March, Rebecca from Colouring Me Happy was my featured blogger. You can read that post and see other past featured blogs under the "blog of the month" label! Being my blog of the month gets you a designated blog post, a sidebar button, and a mention on my Twitter account. The sidebar button stays up all month long. I don't believe in necessarily making bloggers pay for advertising and I'd much rather show you blogs that I really enjoy reading. And I hope you end up enjoying them too! This month, I have chosen Meaghan from Messy Buns and Roses. I have actually featured Meaghan before when she ran her former blog. She has since stopped blogging on that one and started this new one not long ago. Her blog is mainly a mix of beauty and lifestyle. A few recent blog posts include her beauty wishlist, body positivity, and sharing her favorite apps. 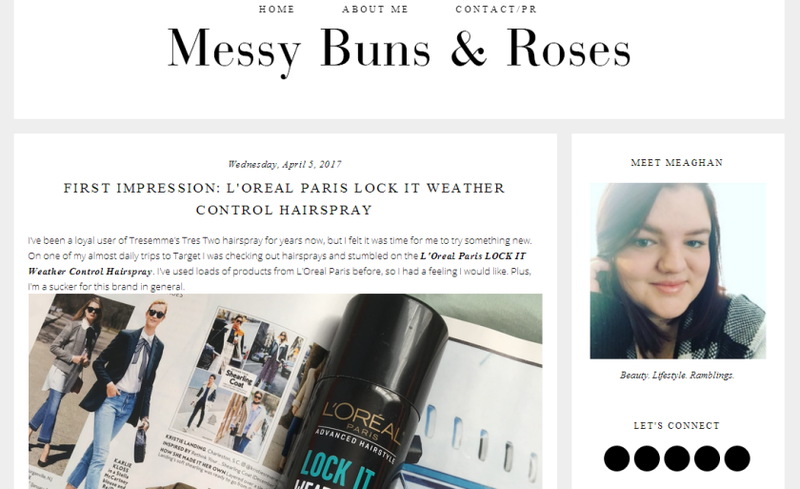 Considering I first featured her former blog in 2013, we go back a bit and I am so happy that she is still blogging! Feel free to let her know that I sent you, if you stop by!